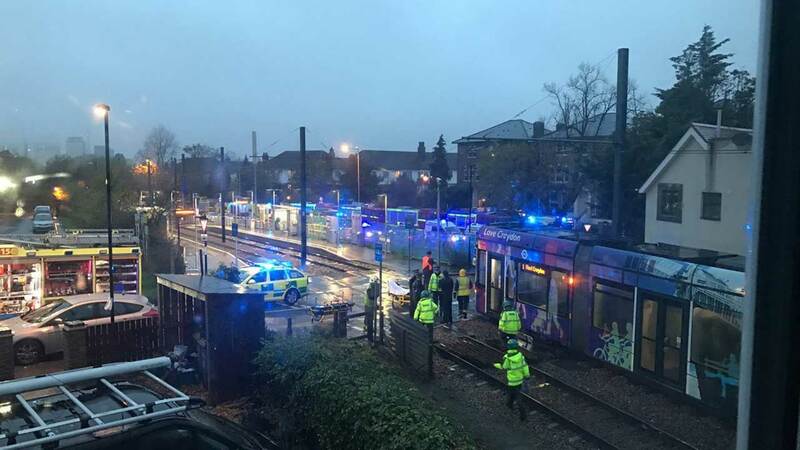 LONDON -- Five people have been killed in a tram accident in south London, British Transport Police said Wednesday. More than 50 people have been taken to hospital with injuries after the tram derailed in the Croydon area. Investigations are ongoing as to the cause of the derailment and one person has been arrested. The tram derailed soon after 6 a.m. (1 a.m. ET) Wednesday near the Sandilands stop, east of Croydon town center, the British Transport Police statement said. Croydon is a large town in south London that is home to around 38,000 people. Resident Hannah Collier tweeted that she "heard a massive crash" outside her window and could see "emergency services everywhere." She later tweeted: "This is horrific, I can't believe people have lost their lives, my condolences to all those affected." The London Ambulance Service said it had sent 22 ambulance crews to the scene and taken 51 people to two London hospitals for treatment. "We have treated a number of patients at the scene, mainly for minor injuries such as cuts and bruises, however very sadly some people have died and others have suffered serious injuries," said Peter McKenna, deputy director of operations at London Ambulance Service. Croydon council leader Tony Newman said: "This is a sad day for Croydon and our thoughts are with everybody affected by this tragic incident and all those people who are working at the scene." The-CNN-Wire & 2016 Cable News Network, Inc., a Time Warner Company. All rights reserved.